Based on the long Anchor Link Scrolling Effect thread on the HubSpot Community, I know that a lot of you are looking for a solution, so I've outlined some below. Yes, they do involve some code but I hope that this post is written in such a way that you should be able to implement it even without help from your developer. Ideally, this will be added into your website's stylesheet but, if you're not certain how to locate this, the simpler option for non-developers is to add it to the HTML head section. You can find this by going into your Settings > Website > Pages and finding the box that says "Site header HTML" (details here). Unfortunately each browser is a world of it's own and this property isn't currently supported across all browsers. At the time of writing, it's supported on Chrome, Opera, Firefox and Android but is not supported on Internet Explorer, Edge, Safari or Opera for mobile. You can view detailed browser support for this property here. This code is from the guys at CSS-Tricks, who have all kinds of great tutorials on front-end web development. Note their conversation about smooth scrolling and accessibility which raises some important concerns. Now that your website supports smooth scrolling, you'll need to create your links. Note that Call-to-Actions behave differently, you can read more on this below (see what I did there?). For example, in the GIF at the top of this post I gave the "HubSpot CMS Design & Development" section an ID of "services-block-2" and the link, instead of going to a URL, goes to "#services-block-2". 1/ Add an ID to the section you would like to scroll to. Your ID can be anything, but there are some basic rules (it should be unique, contain at least one character and no spaces). It's best to make it something descriptive, like the title or purpose of the section. If there's a section on a web or landing page you would like to link to, you'll probably need to do so from the template level. To find the template, click into your page's Settings > Advanced Options and click on "Edit this Template" (details here). When you create your link now, instead of adding in a URL (like http://www.puppiesareawesome.com), you'll just add in your ID preceded with a hash symbol (#), just like on social media. 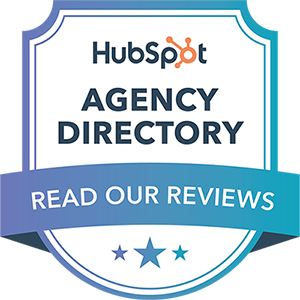 Marketers use call-to-actions across websites for reporting so many of you might be wondering how to apply smooth scrolling to a HubSpot CTA. 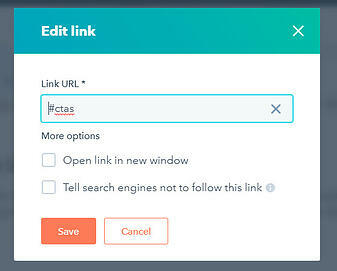 Unfortunately HubSpot's CTA tool doesn't allow you to just type in an ID in the link section, like "#services". Instead they suggest that you write the full link "http://www.website.com/#services" which will cause the page to reload instead of applying your smooth scrolling. I would recommend creating a normal non-CTA link (you can always create clicked element events for tracking if you're on Enterprise) but if you simply must use CTAs, check out Ty's community solution here for a few possible workarounds. And there you have it! Originally I thought this post would be quick and simple but there's rarely a "one size fits all" solution and I've tried to cover a few different options. If you have any questions, let me know in the comments or get in touch!